The vintage home, which was restored by Marin, is filled with her own unique creations. 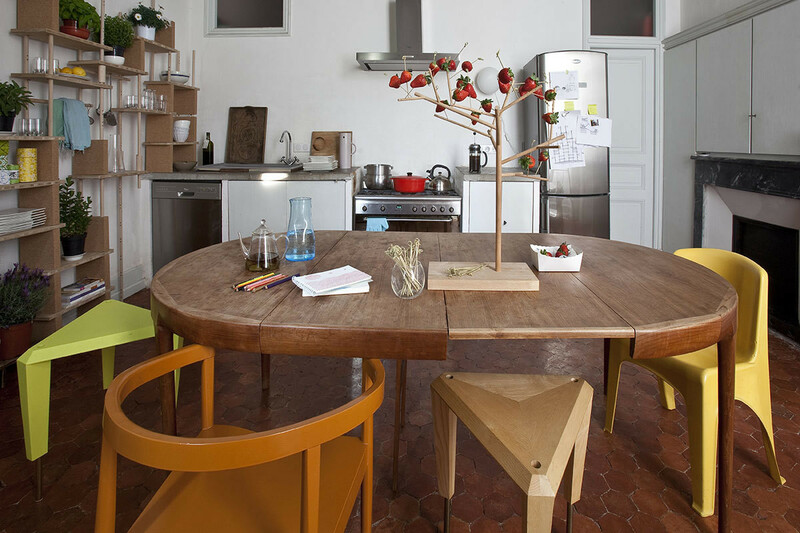 French furniture designer Stéphanie Marin and her Nice home that double as a creative workspace. 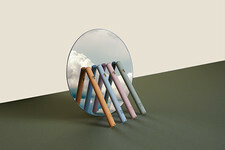 In a peaceful haven by the sea in Nice, Stéphanie Marin experiments with her designs and imagines her future projects. But when she leaves her creative haven, the French furniture designer keeps herself intensely busy. She was present in Milan for the last Salone del Mobile, appeared at Superstudio’s Green Village, and was in Paris for the opening of the Carreau du Temple with her 'Nap Bar,' an installation composed of comfortable lounge chairs designed to encourage visitors to stop and take a nap. 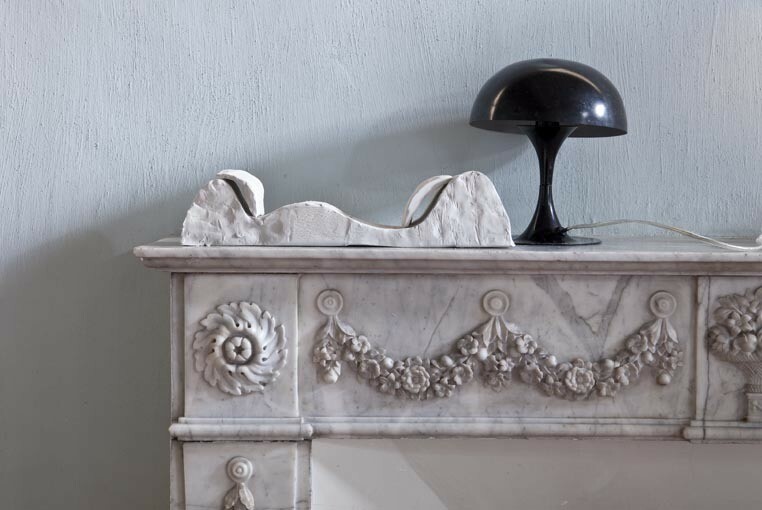 A prototype of Marin's “Dunes” collection sits next to a vintage lamp on an ornate fireplace. 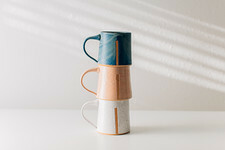 Marin’s schedule has been jam-packed since 2004, when she debuted Smarin’s home line and began to produce a series of objects in ateliers in the hills of Nice. She personally monitors the production of her projects and uses only natural materials like wool, pigments, and local wood. Today, Smarin manufactures about fifteen collections in France that she exports to five continents. Her designs are made up of elements that are both structural and free, adapting themselves to modern life, with its small spaces and demands for multi-functional furniture. 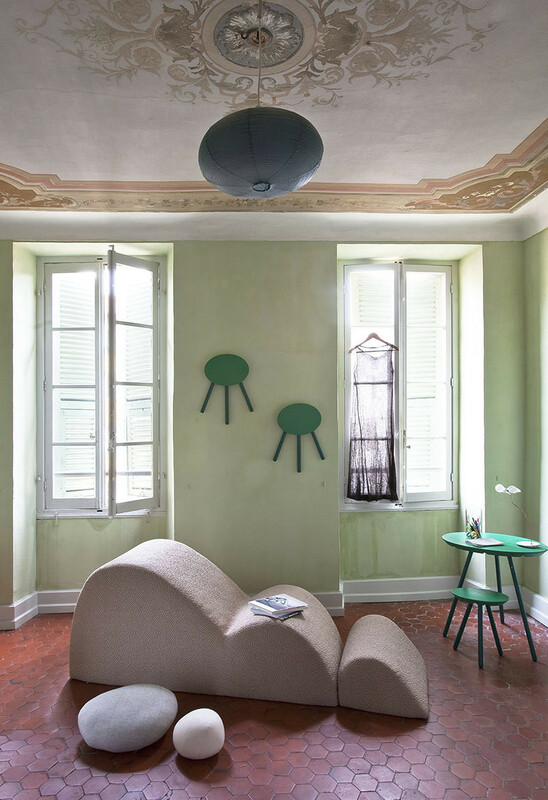 Her eclectic, vintage apartment in Nice is the ideal spot to test and experiment with prototypes under the critical eye of her four grown children, who are also creative. Often, the pieces adapt so well that they find their place and stay there. 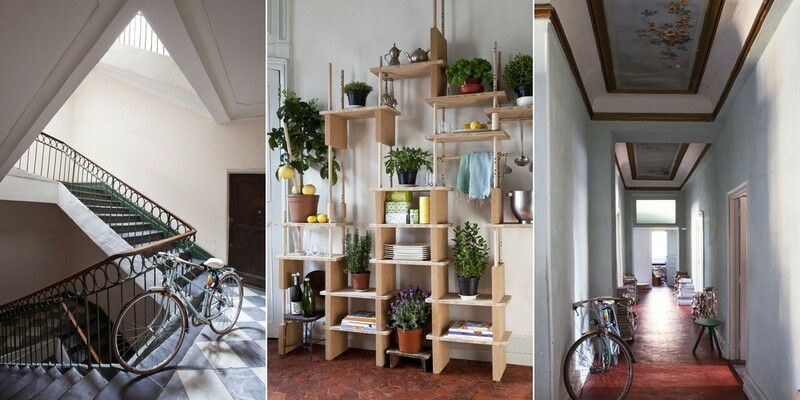 'AccA' modular bookshelf-furniture, designed by Marco Ferreri for Smarin couple with an Acapulco chair. Coffee tables from the 'Livingsland, Archipel' series, made of layers of spruce. Above, 'Mobileshadows' replaces curtains and plays with light. The 'Dune' daybed, with seats of ergonomic form sit next to a green 2D Stool & Table conceived by the designer Sebastian Bergne. The same piece is also hung on the wall above the daybed, while 'Livingstones' pebble cushions provide extra seating. As soon as she arrived in her new home, Stéphanie wanted to restore its soul. “It was an immense and delicate task. I stripped down the walls, straightened and whitewashed them with light pigments. Quickly they took on life and color. The original frescos were restored and the typical local floor tiles were replaced one by one. These two elements only enhanced the atmosphere.” Every day, in this peaceful universe, she is free to reflect, sketch, or touch up a model. She also likes to take unexpected and unexplored paths, which help her see the world in new ways and better respond to it. Like in the 'Mobileshadows' creation, where striking mobiles dominate a room, filtering light and shadow and acting like curtains. 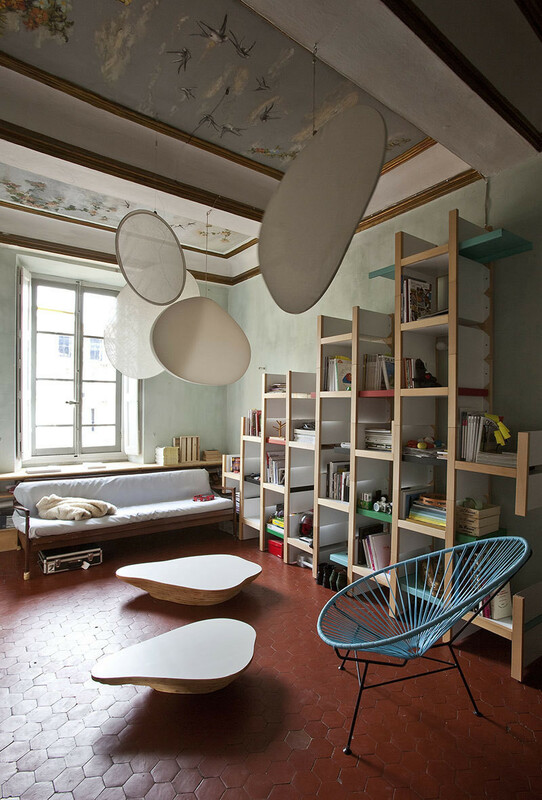 Or with 'Dunes,' an organically-shaped chaise, studied and designed according to different forms. Stéphanie remarks, “The units are assembled, superimposed, and used independent of one another, so they can be freely arranged in an infinite number of natural landscapes.” Practical and aesthetically-pleasing, these designs aim to generate uses and attitudes that invite a freedom of body and spirit. In the antiques quarter of Nice, near the port, there are still many preserved historic buildings. 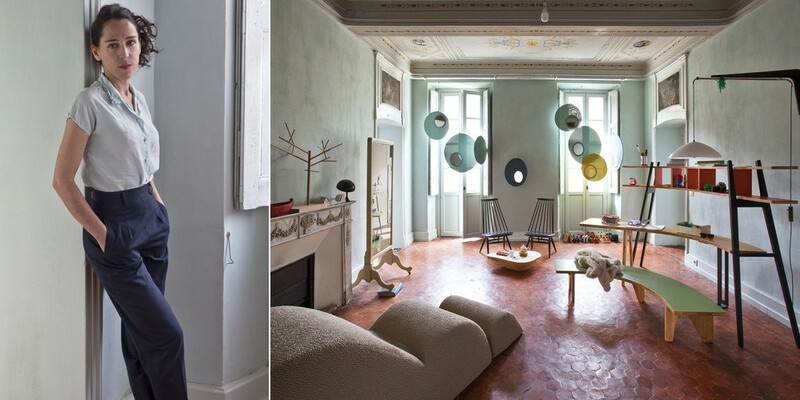 Like the home of Stéphanie Marin, which was built at the end of the 19th century and has changed little since. Seen on the left is a wrought-iron railing with detailing typical of the period, and a floor in Carrara marble and slate. In the center, the 'Play Yet!' modular storage unit in cork and oak provides shelving in the kitchen. Marin’s atelier in the hills will soon become dedicated to production, while another place of reflection will soon emerge: a large studio and laboratory near the port of Nice. Here she can develop pieces such as her ‘Play Yet!’ modular storage collection and her angular ‘Ziggurat’ stools. "Parents and children will be able to build their dreams with the elements of 'Play Yet.' We will also have a program of artistic events that will serve as a laboratory for our creative collaborations," she says. In the same spirit, Marin organizes open studios, like the Playtime show at the Park Floral, in Paris. Smarin was also present on the banks of the Seine this September for the Campaign for Wool; at the Cité des Sciences over the course of November; and at the Aubette 1928 museum in Strasbourg in collaboration with the artist Céleste Boursier-Mougenot, where she presented 'Les Angles,' new diamond-shaped pieces that offer an infinite number of compositions. Other projects in the works? A second line for the lighting manufacturer Blackbody, a creation between canvas and light, plus a small range of colors for the paint company Ressource. Like we said, she's a busy woman these days. The kitchen is home to an extendable dining table in oak. An eclectic mix of seating accompanies the table, including a vintage yellow chair and 'Ziggurat' stools by Smarin. Atop, a piece called 'Mangier, Eating Tree' by Smarin. It was an immense and delicate task. I stripped down the walls, straightened and whitewashed them with light pigments. Quickly they took on life and color." A pair of 2D Stool & Tables conceived by the designer Sebastian Bergne, which can also be hung on the wall. 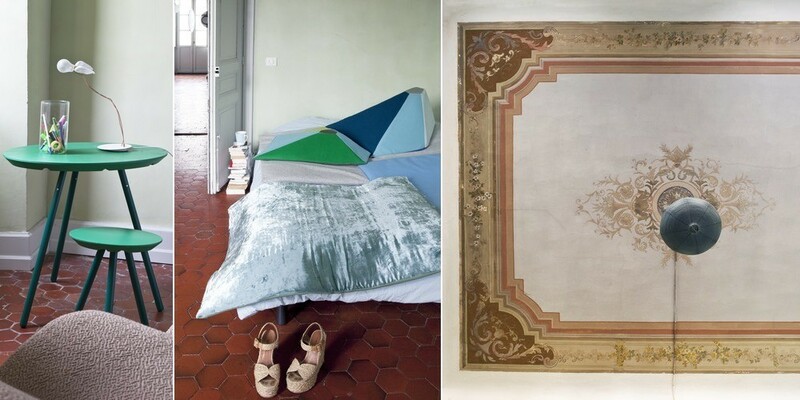 In the center, a brightly colored wool and velvet bedspread sits near prototypes of Marin's 'Angles' cushion. On the right, the original ceiling frescos.